I think it was probably clear that God did a great work in me during our recent week-long mission trip to the Dominican Republic. Unbelievable, awesome, needed, wonderful. But then we come back to the “real world,” with all its distractions, troubles, irritations, frustrations, and on and on. The past couple of weeks have been good, but not necessarily easy. I have been reconnected to God in a way that I haven’t been in years. But the tendency, I think, is to fall into accustomed patterns, familiar habits. Kind if like slipping into a comfortable pair of boots that you’ve worn forever. But sometimes, even though they’re comfie, they are useless, practically speaking. They are no longer waterproof, and maybe not even eater resistant. They have holes in them, no tread, and can only be held together with duct tape. We had planned this trip last fall, but my mother began her final adventure here on earth, and Beth and I had to postpone this trip. At the time we were a bit frustrated. We needed that time for major decompression, just to regain some strength to continue. But isn’t God’s timing amazing? We came down to Black Bear Cabins Thursday evening and will be leaving tomorrow, Sunday morning. Although I gave a good attempt, I cannot tell you how much we were looking forward to it. The solitude, quiet, woods, winter, everything. In that, we were not disappointed. The cool thing is that it has been more than we expected. I’m not sure why, but it just kept playing over and over in my mind. And it was great to reflect upon. The emphasis here is on “How You love me.” And that is sweet water, pure music, balm to the soul. God used the D.R. as a foundation to bring me back closer to Him; a huge rocket engine to gain liftoff. This weekend has been a booster to keep me from falling back to earth, to keep my trajectory toward the heavens. I am refreshed. I am renewed. And I am in love with my King. Not just solemn lessons learned. This has been a very interesting journey. On this blog site, I have chronicled my frustrations, my reservations, my anger at going on a short-term missions trip to the Dominican Republic. And I have posted that much to my surprise and gratitude, it was a fantastic trip. But in reading my posts about the trip, it might seem like this was just a solemn, pious, boring trip. And it was anything but that. I haven’t laughed that hard or that often in a great while, and my wife Beth said the same thing. Of course, some of the stuff wasn’t funny to me except in retrospect, and I was so cranky about the whole thing that the laughter didn’t start until at least Tuesday or Wednesday, but that’s ok, I’m a bit slow sometimes. At the Sunday meeting, we were introduced to the various areas available for us to volunteer our time during the week. I had no idea what I was going to do, but at least I would be with one of my teammates from our church. I was not real comfortable being in that place with a bunch of people I didn’t know, and took comfort in knowing I would be around at least one of the other four from home. I am not a handyman. I’m not too bad at home projects big or small, but I don’t enjoy them. And (speaking in my attitude at the beginning of the week) if I had to go on this stupid trip I’ll be hanged if I do anything that smacks of handy work. So when they said they had light construction and painting, I was able to rule them out in about a nano second. Beth, my lovely, supportive, wonderful wife, who I held tighter on that trip than Linus held his security blanket, pipes up in a chirpy, cheerful voice, “I’m gonna paint!” Say what? Great, just great. One down, but I have three to go. Out of the remaining three, I’m fairly sure I’ll be with someone from home on one of the groups. Vacation Bible School (VBS) for the kids in the village? Not likely, before the end of the week, I’ll likely wind up in a Dominican jail, and wouldn’t that be just lovely? Steph decided that was for her. Two down, two to go. Then there’s the prayer team, which went into the villages with the medical, dental, and optical teams (and VBS). Ok, I pray frequently, but walking around asking strangers to pray wouldn’t likely happen at home, let alone in a place that, as we all know, I was not real thrilled to be at in the first place. Debbie, John’s wife, decided to go with the prayer team. Three down. Now I’m getting nervous. I asked John what he thought he might do, and he said he was thinking about going with the medical team. Whew! That’s what I was thinking, so now I’m a bit relieved. Wow, I was worried a bit there, God, thanks that John’s going medical with me. John and I went and sat down, and listened to the presentation by the medical team leader. After, oh, maybe five minutes, John leans over and says, “I’m gonna go see what the prayer team’s gonna do.” Are you kidding me??!!? Real good, God, way to maneuver me into a position of maximum discomfort. Was that really necessary? Well, yeah, I guess in retrospect it kind of was. And I have posted on what God did with it. I can kind of giggle about it now that I’m on this side of the situation, but I gotta tell you, I was less than happy at the time. John often wound up riding on the same cattle truck that I did, since the prayer team travelled with the medical team. So I did have the comfort of a friend nearby, at least for the ride out and back. But after he left me sitting on the bench, I shoulda heaved him over the side. When we got to the Dominican Republic on Saturday, January 28, we got our bags and went to the parking lot where they had a cattle truck waiting for our bags, and a school bus for us to ride to the Meeting God in Missions facilities. I think Beth told me that the truck was one that we would likely be riding on that week. Remember, at this point I was still very much unhappy with this whole concept. So here I am in a country I don’t want to be in, waiting in a parking lot and loading my luggage in a truck that really don’t want to be riding in for an entire week, getting on a school bus that I don’t want to ride in to go to a place that I don’t want to have anything to do with. The driver was a rather big guy that didn’t smile at all. We sat in about the second or third seat, and I had a real good view of him in the mirror above his head. It seemed like his eyes were at half-mast for most of the trip. At this point in our adventure, I am not impressed. Later on, I learned his name is Victor, and he drove for us quite a bit through the week. He didn’t seem overly friendly, and as I loosened up, I just kind of figured he simply wasn’t real outgoing, and let it go at that. Maybe around Wednesday, I saw him smiling and laughing at something, and remember being a bit surprised. While travelling, I made a couple of jokes with him as he was driving, usually on a difficult stretch of road. I asked Beth how to say “go faster” in Spanish, and would holler it out to him. He looked back in the mirror kind of surprised, I guess, that someone would be talking to him, and when I told him to “go faster,” his eyes got real wide, and he kind of smiled and shook his head. Well, well. I got to where I liked Victor quite a bit. At the end of the week, Beth and I sorted our clothes, which to take home, and which to leave (we had decided before leaving home to donate what we could before we left). I’m a fairly big guy, and in talking with Brian, I realized that there aren’t very many Dominicans or Haitians that could possibly wear my clothes. It’d be more likely that a family could get a couple of my shirts and make a tent. In any event, one of the guys I thought of was Victor. He’s a big guy, too. I had an Edinboro t-shirt, so I gave it to him at the end of the week. Makes a great photo. Braulio was one of the drivers, and it seemed like he was one of the senior drivers there. He drove when Beth was in the D.R. a couple of years ago, and she really enjoyed riding the trucks with him at the wheel. He also is a big guy, easy-going, and has a good time with the people at MGM. Just a lot of fun. Tito is the brother of Meirka, a Dominican woman who Beth connected with last time. Tito is really athletic and muscular; you should see him swing a ball bat. He was kind of the door guard, making sure that unauthorized people didn’t get in, and that the gates were locked/unlocked at the appropriate times. I had a chance to sit and talk (kind of) with him a couple of times, and really, really got to enjoy being around him. I was honored to give a couple of shirts to Braulio. Tito got my suitcase. I know that it could look like the “rich” American giving cast-offs to the “little people.” Yep, I am an American. Yep, by D.R. standards I’m probably wealthy. Yep, I gave from my surplus. But in my case, I was honored to give good stuff to people who I considered to be my friends before I decided to give them anything. I refuse to apologize for where I happened to be born, and I like to help my friends wherever I can. 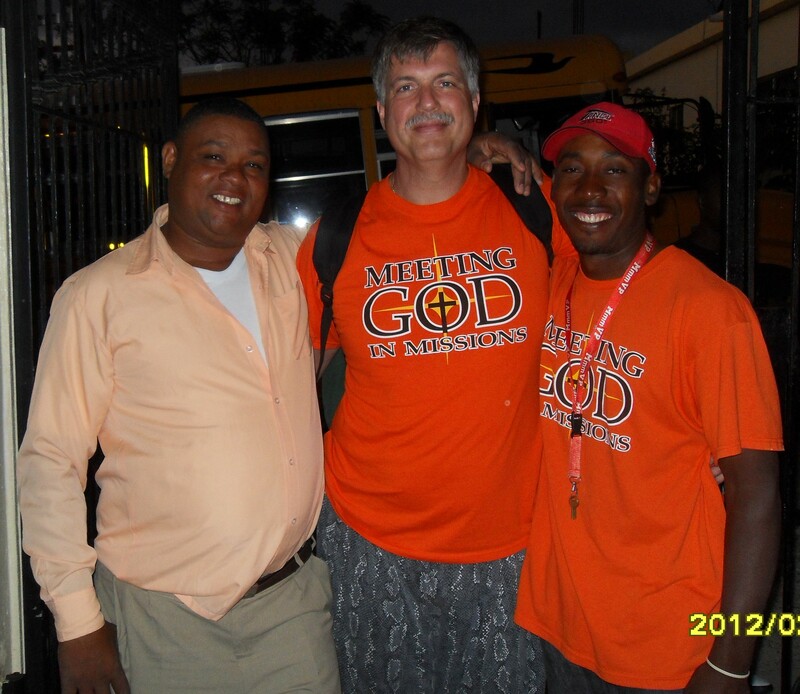 And thanks to God’s mercy and grace, I was able to serve for a short time in the Dominican Republic. I was surprised to become friends with a few of the Dominicans with which I came into contact, and I was pleased to give them items that they could find useful. And I am the richer for all that. 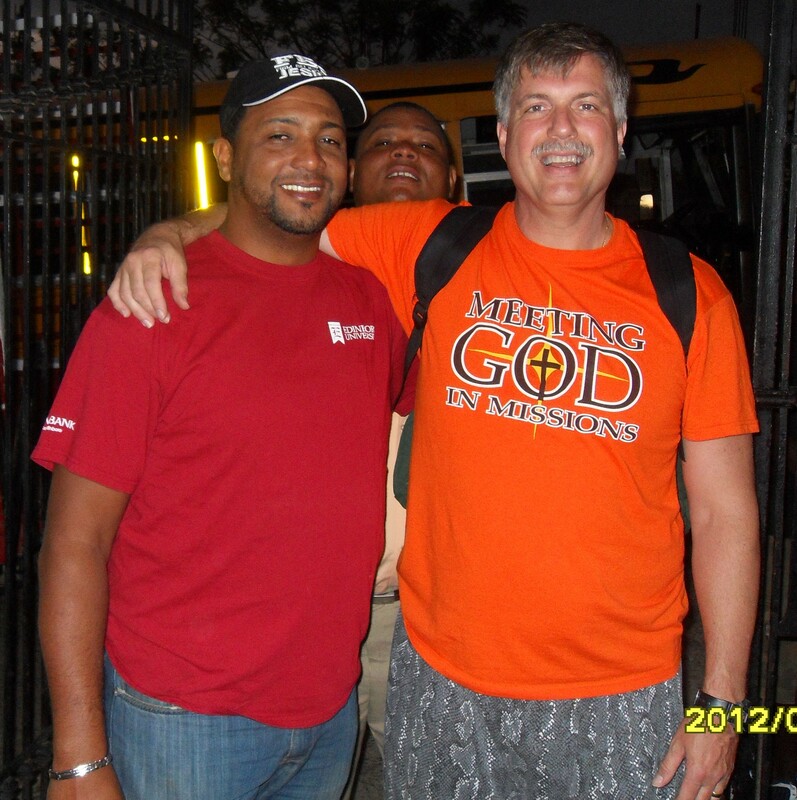 We were fortunate that when we went down to the Dominican Republic, we were able to stay with some friends of ours that are full-timers with Meeting God in Missions from our Church. Brian and Jen Heinrich have been with MGM for a year or so, and we haven’t had a chance to spend time with them for quite a while. Actually, we didn’t have much of a chance to do that last week. They were busy doing their jobs, and we were busy doing our stuff with MGM for the week. But it was nice to grab a few minutes here or there to talk with them. It was nice to get to know their kids a bit better, too. Their oldest daughter, Jamie, is a really sweet kid, and it was pretty cool to get to see her moving in and out with the people down there, both DR nationals and visitors from the ‘States. It was also neat to see their son Elliot running around, too. He’s seven, and still a kid. he has a bit of a hard time with the Dominican kids, and hung around with the visitors a lot. I like him. It was also very interesting to meet new friends, too. 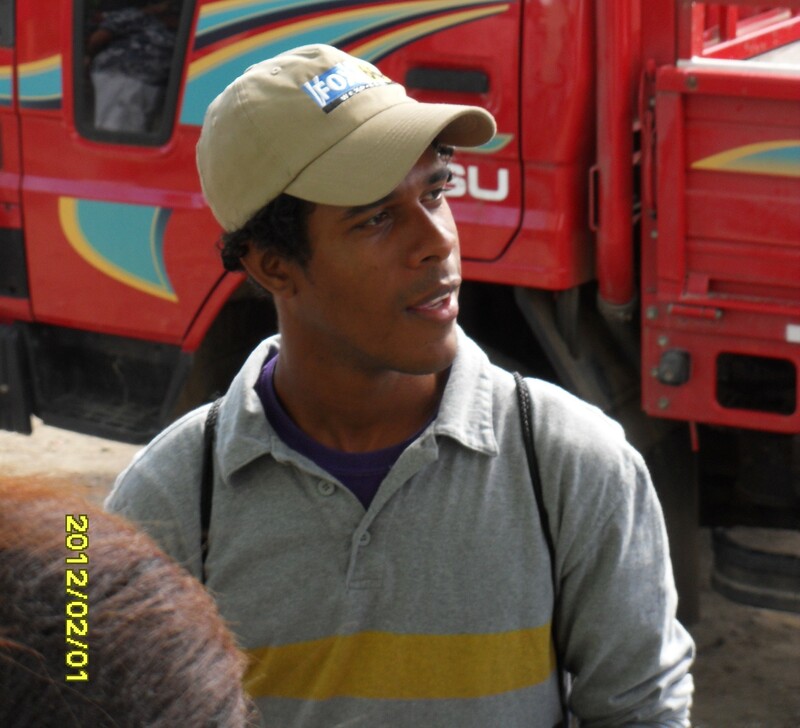 There was one young man who went out with us every day and helped translate between the staff and the Haitians. His English wasn’t great, but he worked hard at helping. Through the week I had taken several of those packaged peanut butter/cracker snacks to hand out to kids or to anyone I felt “led” to give them to. I also took Kashi bars and peanuts for me to eat. No lunch, so I would grab a handful of peanuts when I felt like I needed something. I would usually eat one pack of the peanut butter crackers and a Kashi bar through the day, too. On Monday, I had been handing out some of the peanut butter crackers, and I thought it time to open one for me. I looked over, and Tommy was sitting kind of between helping. I went over and gave him one of the peanut butter cracker packs to eat, and he seemed to appreciate it. Through the week, we made a habit of this, when I ate one for me, I gave him one, too. It only took a day to start to feel a bit of bonding with him. I noticed a lot of the other young interpreters were wearing ball caps. But not Tommy. He was “capless,” with his hair just running wild. I had taken a cap to wear if I needed it, but found I didn’t need a cap, so I just kept it in my backpack. I considered giving it to Tommy at the end of the week, kind of a “grand going away” present. But by Wednesday, I felt prompted so strongly (actually I felt like I was being squished, the feeling was so strong) to give Tommy the cap, that I did just that. You would have thought I just handed him the keys to a new Lexus. He put it on his head, but it was sized for me, so it kind of looked like a shopping bag would on me. But the next day, he came in wearing the cap, and looking proud. I was, too, a bit. My new friend Tommy. At the end of the week, he came into the dining area, and handed me a note. I will type here what the contents were, and as they are in the note. I love you too, Tommy. You touched my heart. I am of the persuasion that once “saved,” always “saved.” That is, once one comes to a real understanding and acceptance of God‘s plan for salvation through the finished work of Jesus Christ, one can not lose that salvation. I believe that even if someone saved falls into a worldly lifestyle, when they die they will enter heaven, even if their clothes “smell like smoke.” They have attained salvation, but just barely. I am not looking for debate on this subject, nor will I entertain debate on this right now. I am offering that as a backdrop to say the following. I believe that Satan recognizes that he cannot claim someone saved by God’s grace. So his efforts in our lives aren’t, I think, intended to re-claim a soul; he cannot do that. His desire is to make the Christian ineffective. If I, as a Christian, am living a life that is not vibrant and Christ-centered, I am nearly useless for furthering God’s designs on those around me in my life. And that is pleasing to Satan. On Saturday, February 4, we came back from the Dominican Republic from a short-term missions trip. The trip was unbelievably fantastic, and God reached me in several wonderful and unexpected ways. We had been warned that Satan would attack when we returned to the ‘States, and I kind of already figured that out myself. But it was good to be reminded. Because Satan didn’t waste any time, he got right to it with me. Beth and I live in a small town outside Erie, Pennsylvania. To get to the D.R., we drove to Buffalo, NY, and flew to JFK in New York City, then to the D.R., and the reverse to get home. The road to Buffalo from Erie is nearly a straight shot. You just get on Interstate 90 and head east for a while. Easy. As is the reverse. But not, apparently, for me. I have been to Buffalo, NY, multiple times in the past few years, travelling into Canada, travelling to the Niagara River for a drift dive, whatever. The route home is the same each time, and I know the route fairly well. However, on Saturday we got back from the D.R., I got the truck, got back to the airport, and loaded up. Beth and I were satisfied, content. I was looking forward to the ride home, just being easy with Beth and talking about the past week. And as we started for home, I somehow (I have no idea how) missed the turn to get on I90, and wound up in downtown Buffalo. Anger! Frustration! Bad words! And I hadn’t been back on American soil for more than, what, half an hour? We quickly got back on track and things settled down, but thus it started (clarification: the route error was maybe Satan’s, the reaction mine). Beth and I missed church on Sunday, and spent the day trying to catch up on rest. I also took Monday off work for the same purpose. Through much of Sunday and into Monday, I just felt useless; ineffective; a failure. In short, I felt just as I had before we left. And what really depressed me was that it all happened so quickly. We just got back, for crying out loud! Geez! Couldn’t I even have one stinkin’ week feeling ok? And then it hit me. Oh, yeah, Satan is going to attack! And he has. If he can just get me to slide into the way I used to be, I will be as ineffective as I was. Focused on the wrong things, depressed, and not living the abundant life that God promises. Oh yeah, I forgot! Well, we don’t want that to happen, do we? No, we do not. So what do I do? I remembered the promises God had reminded me of the past week. I spent time in God’s Word. Prayed. Reflected. And I remembered, God doesn’t want my accomplishments, He wants me. He wants me to have relationship with Him, not for me to be focused on success, even success as a Christian. And how freeing that is. I am basking in His love, resting in His grace. I am learning this, and for me it is a huge paradigm shift, an entirely new mindset. I figure I will have setbacks, and times that I forget. But I’m working on it. Working on letting go of me, and letting God do as He will in me. Gal 2.20: I am crucified with Christ and I no longer life, but Christ lives in me. And the life I now live in the flesh I live by faith in the Son of God, who loved me and gave Himself for me.